Ranjani de Silva meditated with Bhikkhuni Ayya Khema of Germany . In 1987, Ranjani traveled from her homeland of Sri Lanka to Bodh Gaya , India . There she attended the first conference of Buddhist Nuns. At this conference, the participants felt the need to acknowledge and support the work and status of women in Buddhism. Thus, Sakyadhita International Association of Buddhist Women formed. In 1993, Ranjani de Silva organized the 3rd International Conference of Sakyadhita and women from 27 countries and of various Buddhist traditions attended. This meeting greatly contributed to consciousness-raising in Sri Lanka , and greatly elevated the status of nuns in Sri Lanka . 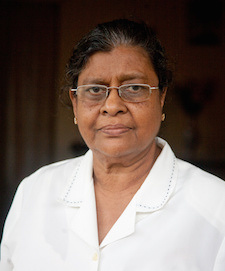 In 1995 in Ladakh , India , at the 4th International Conference, Ranjani de Silva was elected as the President of Sakyadhita. She was re-elected as President again in 1998 at the meeting in Cambodia . Ranjani de Silva has offered Buddhist women the world over vast wisdom and inspiration. She traveled the world, lecturing at conferences and seminars to elevate the status of women in Buddhism. She remained President of Sakyadhita until 2001. Ranjani de Silva coordinates the training of many women to become Bhikkhunis, and she arranged for their higher ordinations in India, Taiwan and Sri Lanka. In the past five years, she has helped women from many countries to ordain: Malaysia, Burma, Thailand, Vietnam, Taiwan, Australia, New Zealand, Canada, USA, Germany and the United Kingdom.